A good creatine powder supplement is without doubt one of the best legal supplements you can take. Itcan increases strength, speed, power and muscle mass noticeably to the muscles of the body if used correctly but does creatine work and what is creatine in this article we answer these questions. Creatine raises muscle energy availability. Muscle Cells in our body store energy in the form of a molecule known as adenosine triphohsphate (ATP). The amount of work our muscles can perform is a result of the amount of ATP they have stored as well as the ease with which ATP is regenerated. Creatine is a natural component of skeletal muscle. Meat and fish are the richest natural sources of creatine. However, the quantity is low due to cooking these foods. Creatine is an organic compound found naturally in red meats and fish. For those who ingest these foods day by day the typical amount of creatine digested is roughly about 1 gram. A five-gram dose of creatine was found to significantly elevate blood creatine concentrations peaking about one hour after ingestion and returning to baseline levels after 2-3 hours. In order to keep creatine elevated throughout the day, a five-gram dosing regimen every 2 hours for 8 hours was adopted. This is to be maintained for the first 5 days of use after which a two 5 gram servings are to be ingested twice a day. Benefits of taking Creatine Creatine monohydrate will assist you train harder in the gym so that you lift more weight and build more muscle. Creatine won't make you gain fat, but it will help you gain more muscle. 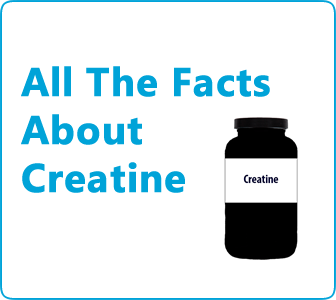 Creatine is usually taken within a 6-12 week period known commonly as a cycle. The first week of the cycle is spent ‘loading’ where the you the individual takes 20 grams of creatine monohydrate per day to saturate your cells. After the first week (weeks 2-onwards) 10 grams of creatine is to be consumed twice daily -once in the morning on an empty stomach and once after training. Take 30-40 minutes before consuming your next meal for maximum absorption and assimilation of the creatine. Include dextrose in your shake if you're just taking straight creatine monohydrate and whey protein. This is known to increase the uptake of creatine within the cells. From my years of taking creatine I have noticed that creatine results were only ever as good as I made it. What I mean by this is that if I didn’t do the proper ground work prior, during and even after my 6-10 week cycle I would find that my muscle and strength gains were not nearly as significant as when I did do this ground work. This ground work is far from just doing the hard yards in the in the gym. In fact it is everything but your weightlifting routines in the gym that can see you reap more creatine benefits. In order see fast muscles gain you should chose a period of 6-12 weeks where you do not have any other major commitments such as work deadlines, vacations, excessive aerobic exercise etc. This period should allow you to ALWAYS have time to lift weights 3-4 times per week. Get rid of your old weightlifting routines that you have been doing for months. Chances are that your muscles are stale and not getting full stimulation from doing the same old exercises every week. Start a new weightlifting program made up of good compound exercises to increase strength and encourage new muscle mass. Establish your Max lift for each exercise on your program during your loading week. Take note of the results. Over the coming weeks of your cycle you MUST aim to improve on these lifts every week to maximise gains in strength and muscle mass. Eat approximately 1.5 grams of protein per pound of bodyweight and consume 6-7 meals per day. You should also be consuming a greater number of calories than your Calorie intake for maintenance of body weight. Drink a 4-6 litres a day to ensure that the creatine you drink is absorbed properly. Avoid caffeine. If you were tracking you lifts over the cousre of the time you were taking creatine then you should aim to maintain these lifts so that you know you have gotten stronger from the time you have taken this creatine powder supplement. Creatine and women are words that infrequently heard together. If you’re a woman with a goal to gain muscle mass creatine can certainly be advantageous for you. It’s no mystery that very few women take creatine or in fact any powder supplements for that matter. Commonly, it's men who you see guzzling back protein, creatine and other soluble supplement powders. Creatine and women, why don't they mix? Well, my theory is that men tend to have different goals when it comes to working out. Typically, men are more orientated around building muscle mass which leads to an intake of supplements such as creatine for them to grow. Women on the other hand are far less fixated about building muscle especially for aesthetic reasons. This tends to be due to the sparse number of women who engage in power and strength based sports such as rugby, football, weightlifting and so on where creatine and protein supplements can be beneficial to performance. From my own personal experience the majority of women’s goals with regard to health and fitness tend to be around losing fat on various regions around the body. The added water retention that a creatine cycle induces makes it clear why women usually steer clear of introducing creatine in their diets. However, for those few women who do engage in power or strength based sports or who wish to gain muscle mass I would highly recommend supplementing your diet with creatine. You’re far more likely to see improvements in strength and power as a result of taking. Creatine is a naturally occurring amino acid in the muscles of the body, similar to the building blocks that make up proteins. It is manufactured in the liver, kidneys and pancreas. Its use is to supply energy to muscle cells and it acts as a storage battery for the energy that is produced from food. Red meats and fish are natural sources of creatine. With a balanced diet, the majority of people get all of the creatine they need to maintain their health. However, Creatine is degraded during cooking making it very hard to get a decent dosage of creatine from foods. Obviously if you are a vegetarian you will be missing out on creatine without supplementing it. For example, 2-3 pounds of raw meat or fish contain the equivalent of 5 grams of pure creatine monohydrate powder. Since heat degrades creatine, however, cooking will reduce the creatine content of these foods and increases the amount you’ll need to eat to obtain a given amount of creatine. While it is not possible to take in enough creatine through diet alone to gain a significant benefit, we can safely add it as a supplement. Extensive research shows that creatine can help you pack on muscle size and strength fast with no harmful side effects, when combined with your weight training regime. Many athletes turn to various supplements to get a winners edge and many also find they are throwing their money away on useless, and sometimes harmful, garbage. Creatine, however, may actually be able to deliver improved athletic performance – for a short duration. It has been shown to be such an advantage in body building that some countries have banned the use of several forms of creatine in competition. YES! If you want to gain muscle mass and add strength! Creatine is without doubt the most impressive natural performance enhancers readily available on the market today. This is a due to the way in which it can noticeably increase strength and muscle mass over the period in which you use it. If you’re someone who is serious about their training and by that I mean someone who on a consistent basis trains intensely, eats frequently and well and some who watches their lifestyle to gain muscle mass then I would definitely recommend taking creatine. If you are one of these people who constantly tries to eek out another rep in the gym or add another singular kilo to a squat or bench press then creatine will be beneficial to you. I wouldn't recommend taking creatine if an individual who doesn’t maintain a planned and tracked workout routine and someone who only eats when then can and when they do it’s usually foods of low nutritional quality such as deli sandwiches, pizzas, fries etc. To be honest, the later type of person tends always to be the ones who complain about the ineffectiveness of Creatine. This is because these are the people who are looking for a quick fix or a miracle supplement that is going to get them looking like the guy on the cover of a magazine. The truth is though that creatine does make a significant difference to those who count all the kilos and the rep they push in the gym. In addition to this I don’t mean purchase the $50 creatine powder supplement on the shop shelves. I’ve taken many creatines from over hyped creatines to creatine ethyl ester and the one I always keep return to is Micronized creatine monohydrate which happens to be the cheapest and also the best! Find out before you take any creatine powder supplement to gain muscle mass. Over the course of the past few years that I have been taking a creatine powder supplement I have found no adverse side effects as a result of it. I didn’t go bald, nor did I get super aggressive or get kidney damage despite what other sources may indicate. If I were to name an effect it had on me other than increasing my strength and lean muscle mass it would be water retention and an increase in overall drive which may have been a result of elevated testosterone. If you’re taking creatine monohydrate expect to notice an increase in body weight and also a visible appearance of looking a bit “soft” as bodybuilders would say. This is due to water retention which is sucked in and stored in the muscles cells. This water results in a lack of definition to the body for the period in which you are taking creatine. Do not worry though, this water retention usually stops once you cease taking the supplement. Expect to see a 1-2kg increase in bodyweight during the end of the loading phase of taking creatine. For the average person water retention is the only negative effect –if you want to call it that- of taking creatine. However, the long term negative effects of creatine are uncertain as research of the subject is relatively recent. Always stick to the manufacturer’s advice on how and when to take the product as creatine levels can vary from each individual serving of any give creatine powder supplement. Also, choose a period of say 6-10 weeks whereby you plan to use creatine. If you are experiencing a lot of adverse side effects many a times then you should stop taking creatine right away and talk to your doctor. Let us know what you think about creatine, do you use it? have you used it and not had the results your where expecting? tell us your experiences and let everyone know from personal experience. If you enjoyed this article about creatine please share it on your social networks and let your friends and family read this information. In order to lead a healthy lifestyle it is suggested that everyone diets and exercises in accordance to their body shape. However, selecting your body shape or knowing which category you fall into may not be as easy as it sounds. Rather than guessing and enrolling on a diet and exercise scheme which is totally unsuitable for your body shape try and do a little research. The following article aims to outline the three male body shapes and the four female body shapes, providing descriptions and other valuable information for each. A woman with an apple shape figure will have a large bust, carry excess weight around the midriff just above the hips and a protruding belly that is visibly round. How do I know if I have an apple body shape? Those with an apple body shape are said to have a waist which is wider than their shoulders and hips, they also have very slim legs. If this is you then you have an apple body shape. When the hip circumference is larger than the chest measurement the figure is known as a pear shaped body. Commonly, women have a small bust and narrow shoulders with large hips, thighs or bottom. How do I know if I have a pear body shape? You will have quite narrow shoulders, arms and top of your stomach. You will have a small bust as well as legs which tend to slim from the knee downwards. If this describes your body then you have a pear shaped figure. A rectangle or ruler shaped body will have hips which are similar if not identical to the circumference of the waist and chest. Rectangle body shapes are a slim figure like a modern fashion model this type is now considered by some to be the ideal look. How do I know if I have a rectangle body shape? You have a rectangle body shape if your waist, hips and shoulders are all the same width. You are also likely to have a long slim legs. If this describes your body then you have a ruler or rectangle body shape. Click here to learn more about the rectangle body shape. When the hips and chest circumference are similar and the waist is slimmer this is said to be an hourglass body shape. Most hourglass bodies also have a large bust and a very distinctive curvy look it is the least common shape but often the most desired. How do I know if I have an hourglass body shape? Are your shoulder line and waist line and equal width, separated by a slim waist? Do you have a large bust and bum with curves in all the right places? If you answered yes to all of these questions then you have an hourglass body shape. Click here to learn more about the hourglass body shape. Most people with an ectomorph body shape have a narrow waist and hips, small shoulders and a flat chest. Ectomorphs can lose weight easily and tend to have low levels of body fat due to their high metabolism rate. How do I know if I have an ectomorph body shape? Males with an ectomorph body shape are very similar to females with a ruler body shape. Their body is seemingly the same width in the shoulder, hip and waist areas. Long arms and long legs are also a feature. If this describes you then you have an ectomorph body shape. Males with this body shape tend to have bigger bones that the other body types. These men and usually have round faces with larger thighs and hips. They also have arms and legs that tend to be short and tapering, giving them a stocky appearance. How do I know if I have an endomorph body shape? Does your body have a curvy appearance? Are your abdomen, hips and thighs larger than your chest and shoulders? If so then you are more than likely an endomorph. Click here to learn more about the Endomorph body shape. People with this body shape are usually described as having an athletic physique. They have a larger bone structure in comparison to ectomorphs and have a naturally muscular body. How do I know if I have a mesomorph body shape? Are your chest and shoulders large and wide in comparison to your waistline? Are your abdominal muscles tight and solid with your hips the same width as your shoulders? Are the muscles in your legs large and well defined? If you answered yes to all of the above questions then you are likely to have a mesomorph body type. Click here to learn more about the Mesomorph body shape. All of the information included in this article is designed to give both males and females an indication of their body shape. Some may have already known their body shape and just wanted clarification, for others this may have been a new experience. The important part is that you know what your body shape is. Identifying your body shape is for some the first step to transforming it, this may be losing weight as an apple shaped female or adding weight as an ectomorph shaped male. The body shape section of this website houses a host of information on the various body shapes. Those looking to develop their body shape are strongly advised to look at this information beforehand. Information on specific diets and exercise plans are included as well as valuable information on health risks. If you have any questions or queries then please do not hesitate to leave a comment at the end of this article. We value feedback from readers very highly and are always willing to offer advice when needed. It's your time to shine, let us know what you think about our article, do you know your body shape? have you got any body shape questions you would like to ask the team? Let us know your opinion in the comments box below or send us an email. Body shape is a term which refers to the region in which a person tends to carry their excess weight. There are four body shapes – the apple, the pear, the hourglass and the ruler. Body shape analysis would indicate that a woman with an apple body shape tends to have curvaceous hips, slim legs, large breasts and a relatively large waist. Learn more about apple body shapes. The typical pear shaped woman usually has a slender upper body with slight breasts accompanied by a heavy lower body. Learn more about pear body shapes. The most desired female body shape is the hourglass, natural curves and large breasts are very much on a girls wish list. Read more about the hourglass figure. The fashion model and athlete body shape “rectangle” is the modern style icon figure but if you don't have the correct diet it can lead to major health issues. Read more about the rectangle figure. Do I Need To Know My Body Shape? It is important to understand that not everyone responds similarly to exercise and diet regiments for fat loss and what may work for one woman many not necessarily work for another, with so many variables to take into consideration such as weight, height, age, daily activity and of course the shape of your body it becomes apparent that no two diets or fat burning workout plan will ever be the same if they are to be effective. It is for this reason that we stress the importance of individuality when trying to establish fat burning diets or fat burning exercises. This ensures that the weight you wish to shed will be as quick as possible. Undertaking body shape analysis with the body shape questionnaire before you plan on undertaking a fat loss routine can be beneficial in many ways. It can bring to your attention aspects of dieting, exercise and lifestyle which can all work together to make your fat loss goals more effective. Unfortunately, if you are someone who is unhappy about your body shape then I’m afraid to say that no matter how much body toning or exercises you do is going to change that shape of your body to something more along the lines of Cindy Crawford. For most women though a poor body shape is not the issue but rather the ghastly fat distribution as a result of your natural figure, A dislike of your body is common amongst women of all ages in fact a study showed 88% of women dislike there body and 92% of women would like to change something on their body. It’s fair to say that fat is ugly regardless of whether it resides around your hips like an pear body shape or all over the midsection like an apple body shape, So before you go into despair yelling “I hate my body shape!” I will alert you to the fact your body shape isn't the problem. There are many examples of people across of each of the four body shapes who have excellent figures. It comes down to consistently following a smart diet and exercise regime that suits your body shape, of course this requires discipline, patience and motivation. Check out our main body shape page it has links to all four body shapes each with it's own diet and fitness routine designed for that body shape. There is much light being shone these days on dressing correctly to suit your shape though the use of good body shape wear. This simply means that your troubling features – such as your hips if you are an apple shape – are disguised and your better features such as your shoulders are accentuated. As a result this will give you a more well proportioned look to your body. For example, an individual with a rectangle body shape with few curves to the body could wear something like a loosely fitting coat tightly button around the midsection to make the upper body and the hips protrude more and in turn revealing a more voluptuous, curvy look. This is just one of the many examples of dressing for your body shape. Another typical example of creating illusion oppose to your shape would for an individual with the much sought after hourglass figure. This person's body would usually be broad in both the upper and lower body regions with a narrower midsection. Scarlett Johansson is referred to having the most sought after hourglass figure in the world. If you are an hourglass what you should aiming for is to draw attention to those fabulous curves of yours. This can be achieved by generally wearing well fitted garments such as dresses and jeans which clearly define the waistline. The effects of wearing the correct apparel for your body shape can be truly staggering and I would advise looking into this in more detail, while I try to find an expert on the subject who can write about this in more detail …stay tuned!